BIALOWIEZA, Poland (Reuters) - Inside Poland's ancient Bialowieza Forest, birds chirp and bison graze as visitors explore the lush green surroundings, a home to boars, beavers, lynx - and beetles. Occupying almost 580 square miles of woodland, Bialowieza is a UNESCO World Heritage site sprawling across the border with Bielorussia. 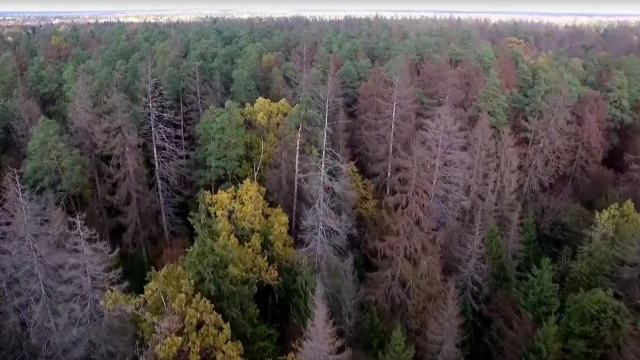 But Europe's last primeval forest is under attack, from bark beetles eating its spruce trees. Foresters working in Bialowieza and the government say the solution is to cut down more trees, to save other trees. In March, the environment minister said he would approve increasing the harvest. The new limit would be about 188,000 cubic meters, up from the current 63,000 cubic meters for 2012-2021, which is already close to being exhausted. Last month, authorities began sanitary logging, chopping infested trees along routes used by tourists. The decision has infuriated environmental campaigners, who have complained to the European Commission, saying the logging threatens natural habitats. Scientists also argue that at 8,000 years old, the forest has survived two world wars as well as past outbreaks of the bark beetle, or Ips typgraphus. "Even if in some areas of the forest the trees will die, they will be replaced in a few years time, sometimes in 10, 20 years, by other trees," said Rafal Kowalczyk, of the Polish Academy of Science. "This forest is very dynamic and the changes we have observed, for examples (with) outbreaks of bark beetles, show the natural adaptation of this forest to the changing climate." Around a sixth of the forest in Poland is a national park, and trees there cannot be cut. The rest is operated by three forest units, supervised by the state-owned National Forest Holding. Some in the local communities agree with environmentalists. Many others support the foresters; they say campaigners are attacking the source of their livelihood. "The problem is that several years ago there was an outbreak of bark beetle and it got worse," said Anna Malinowska, a spokeswoman for the National Forest Holding. "The only way to solve the problem is to cut down affected trees. This was not done and so the (infestation) spread." A UNESCO delegation will visit the forest over coming days to inspect the government's logging plans.